The original Renaissance Man, Leonardo da Vinci preferred to describe himself as an artist-engineer rather than a painter, and he filled notebook after notebook with his inventions, observations, sketches, and designs. 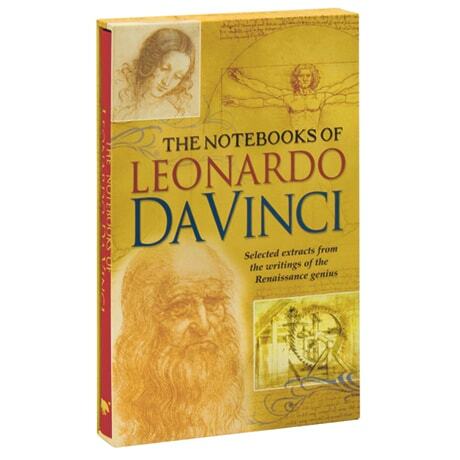 Covered in red linen with gold foil stamping and presented in a heavy illustrated slipcase, this deluxe volume surveys Leonardo's notebooks to illustrate the full range of his genius, with photographic facsimiles of original pages of drawings and notes, as well as color reproductions of key artworks. Throughout, leading Leonardo scholar Edward McCurdy provides translated transcriptions of his notes, offering a glimpse into Leonardo's thought and intentions.